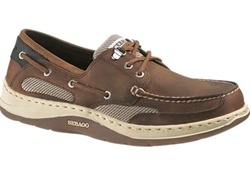 MMAR Medical: Sebago boat shoe- a stylish choice for Diabetics. The Sebago Clovehitch II has a removable footbed, for easy placement of your orthotic. This functional, two-eye handsewn features premium Nubuck and full grain leather uppers with breathable Dri-Lex Hydrofil mesh panels. An anatomical EVA footbed provides comfort while the Sebago Marine Tack sole conceals an EVA midsole for comfort and slip-resistant security.Designed to keep all feet on deck, this functional, two-eye handsewn features premium Nubuck and full grain leather uppers with breathable Drilex® Hydrofil® mesh panels. An anatomical EVAfootbed provides comfort while the Sebago® Marine Tack™ sole conceals an EVA midsole forcomfort and slip-resistant security. About MMAR Medical Group: MMAR Medical Group Inc. is a wholesale distributor of comfort footwear offering a wide selection of shoes for diabetics as well as custom made orthotics. Please visit http://www.mmarmedical.com/ for more information.